It’s not what it sounds like! It’s so much better. Last night Film Independent at LACMA hosted an event called “An Evening with Greg Berlanti” and it was a-mazing (partially due to the Flash Vs Arrow Trailer)! We watched a screening of the “Going Rogue” episode of The Flash (one of my favorites!) followed by a look at the creative process behind the train scene and A SNEAK PEAK AT THE ARROW/FLASH CROSSOVER EPISODE! (Eeek!) The host also sat down and asked Greg some questions about his career and inspirations. Barry (Grant Gustin) is thrilled when Oliver, Felicity and Diggle come to Central City to investigate a case involving a deadly boomerang. Excited about teaming up with his friend, Barry asks Oliver if he’d like to help him stop Ray Bivolo (guest star Patrick Sabongui), the meta-human Barry is currently tracking. Bivolo causes people to lose control of their emotions and has been using that skill to rob banks. Unfortunately, the superhero partnership doesn’t go as smoothly as Barry expected. When Oliver tells Barry he still has a lot to learn, Barry sets out to prove him wrong by attempting to stop Bivolo alone. However, when Bivolo infects Barry and sets him on a rage rampage, everyone is in danger, and the only one who can stop him is the Arrow. Meanwhile, Iris is furious when Eddie tries to get a task force to stop The Flash, Joe and Dr. Wells agree the Arrow is a bad influence on Barry, and Caitlin and Cisco deal with a new team in S.T.A.R. Labs. Oliver (Stephen Amell), Arsenal and Diggle track down the location of a boomerang-wielding killer named Digger Harkness (guest star Nick Tarabay) but are surprised when they come face to face with an A.R.G.U.S. team. Diggle asks Lyla why A.R.G.U.S. is involved but she defers until Harkness attacks the building, killing several agents and targeting Lyla. The Arrow joins the fight and gets help from an old friend – The Flash. Harkness manages to get away and Oliver teams up with Barry again to find him before he can get to Lyla. When Harkness plants five bombs in the city that are timed to explode at the same time, both teams must come together to save the city. Team Arrow and Team Flash were excited to see each other! But that doesn’t last for long. Oliver uses his normal ways of interrogation to get the information we needs in Central City. This does not sit right with Barry and his team. Barry is told not to follow in Ollie’s footsteps and continue being the kind-hearted, just hero that he has become. Some awesome fight sequences! What seems like Ollie training Barry, saying that he will hit him with an arrow and Barry replying that he will never touch him. Ollie catching Barry with one of his roped arrows (guess he was wrong) and Barry dragging him through the streets of Central City. Here comes my favorite part… Wentworth Miller and Dominic Purcell as Captain Cold and Heatwave walking through the city streets (note: this may be a scene from episode 10 according to IMDB credits), can you say Prison Break Reunion? Regardless, this evening just goes to show that The Flash has a whole lot of fun coming our way! 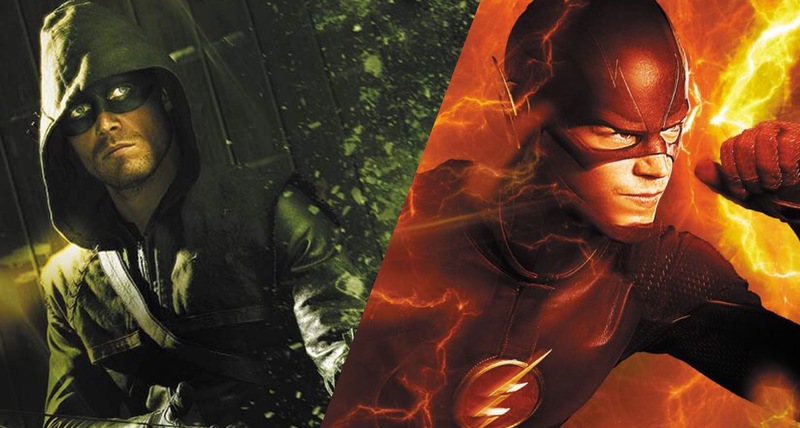 “Flash Vs Arrow” airs on the CW on December 2nd and “Brave and the Bold” airs December 3rd. For more info on our “Evening with Greg Berlanti” make sure you listen to our Beyond the Panels Podcast Episode 4, coming soon. A series of shorts describing the lives of superheroes beyond the panels and interviews pertaining to the superhero world. © 2015 Beyond The Panels. All rights reserved.